Orv traveled to Iowa to instruct a father and son team who had a beautiful Rotorway Exec 162F. We had a wonderful time there and John Jr. went on to become a commercial helicopter pilot, then a helicopter Certified Flight Instructor, opening his own helicopter business and training school called Iowa Helicopters. He is now a helicopter DPE(designated pilot Examiner). Below is an excerpt from an article that John published in Autorotate magazine about our flight training experience together. Here is a testimonial that John sent me to post on the web site for prospective students to read. It was is an excerpt of an article that was published in Autorotate Magazine. The problem that occurred with their helicopter that is described in this story has been solved by the very successful change to a different secondary design and more recently by the factory replacing the standard chain drive with a cog drive belt with belt tensioner. 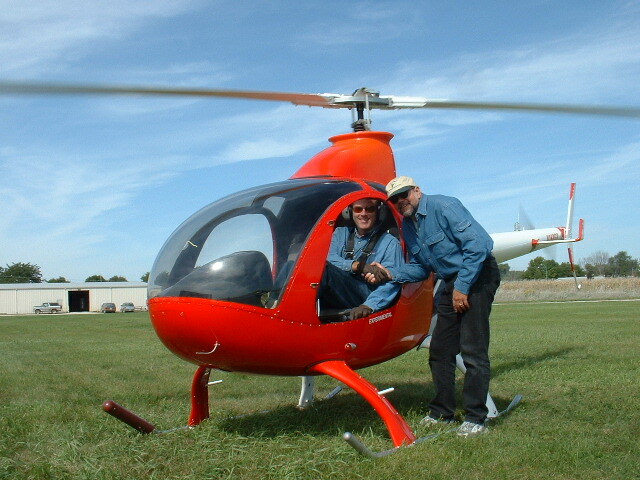 My father and I purchased a Rotorway 162F and began our search for a Rotorway-experienced helicopter flight instructor to provide us with flight training in our own helicopter. 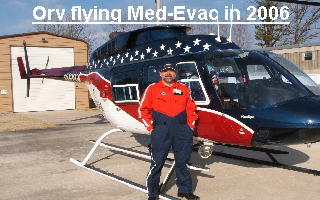 Our search quickly brought us into contact with Orv Neisingh who has made it his career to instruct want-to-be helicopter pilots in their own helicopters. We set a training schedule and in a short time Orv arrived to begin our flight training. Orv first gave the helicopter a thorough airworthiness inspection as he explained the function and maintenance of all of the various components of our Rotorway. He made some adjustments and showed us how to perform the periodic maintenance that we would be doing at the regular maintenance intervals. This included adjusting the torque on the cylinder head bolts, adjusting the valve rocker lash, and many other periodic maintenance items. He also gave us a number or solid suggestions of ways that we could improve the reliability of our helicopter. The maintenance training and upgrade suggestions that Orv gave us was worth the price that we paid for training alone. During a weeklong stay we fully explored the areas where pilots of these small helicopters get into trouble, such as hovering with more that 10 knots tailwind. Orv split his time between my father and I, flying up to his maximum of eight hours in a 24 hour period. Non-flying time was spent doing ground school over a chicken sandwich or chefs salad at the local fast food place. We really felt Orv was giving us our money’s worth. By the time we finished our first week of training, both my father and I were feeling comfortable with the ship and Orv endorsed us both for solo. The solo practice hours came fast and furious, getting 40 hours on the ship in just a few weeks. I would fly four hours, then switch off with my father for his turn. It was my dad who was hovering at three feet AGL toward the fuel pumps when the Rotorway made a loud bang. His training with Orv kicked in and he stopped the yaw, pulled full collective, and got the twitchy tow place copter on the ground without damage. An inspection revealed the secondary shaft, which transfers power from the engine to the main rotor and tail rotor via a system of belts, had sheared where a spherical bearing supports the shaft. We later learned there have been several failures of this shaft in Rotorway helicopters resulting in accidents and destroyed helicopters. This particular shaft failure was the first one that occurred with the new and improved 35mm shaft. I need to note that the helicopter was running a Pro-Drive cog belt at the time. After this close call, we made the decision to have a new shaft and bearing installed and sell the experimental helicopter in favor of a certified R-22. We called Orv and informed him of our decision and thanked him for his fantastic training that probably saved my father and the ship from serious damage. Ironically Orv said that he too had been thinking of moving to a certified ship due to the secondary shaft breakage issues and had just placed an order for a brand new R22 from the Robinson factory in Torrance, CA. So how much will having an instructor travel to you cost? It depends on whether you have your own helicopter. Since my father and I both needed ratings, it worked out well to have an instructor come to us. We could split the time and cost while each flew four hours a day, about the maximum a single student could absorb. Orv was willing to fly with our schedule, whether it was early in the morning or in the middle of the night, just as long as his flight instructing hours did not exceed 8 hours a day. You can expect to pay around $750.00 a day for dual instruction, plus lodging and meals for the instructor. In looking back I know that I saved money by flying every day on consecutive days. The lack of time off meant there was little regression from lesson to lesson. I was prepared for my check rides in the minimum hours required by the FAA plus I got to know a highly skilled individual who today is more than just an instructor, he is a dear friend.